James O Williams, Jr., M.D. 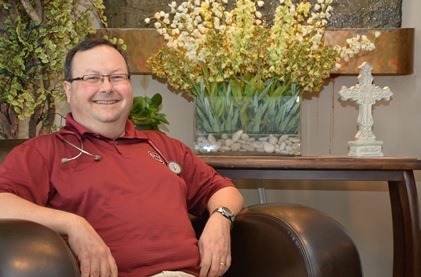 With family always in mind at Agapé Primary Care, Dr. James O. Williams, Jr.’s specialty in Family Medicine brings an unprecedented focus to the family spirit that fuels patient relationships at Agapé. Additionally, Dr. Williams is an advocate for advancing technology to enhance the efficiency, quality, and access in sharing information to improve patient care. Born and raised in West Columbia, Dr. Williams studied at the University of South Carolina and attended the USC School of Medicine where he would become Chief Resident President. Still living in West Columbia, Dr. Williams enjoys playing handbells and attending church with his wife, Mindy and their daughters Hannah and Olivia. At Agapé Primary Care, we understand the importance of choosing the right primary care physician who can meet you and your family's needs now and in the future.That’s why our physicians’ practice is designed around the needs of today's patients with easy access for making appointments, obtaining medication re-fills, reviewing lab results, and more. Lexington, West Columbia, Cayce, Gilbert, Pelion, Batesburg, Leesville, Irmo.